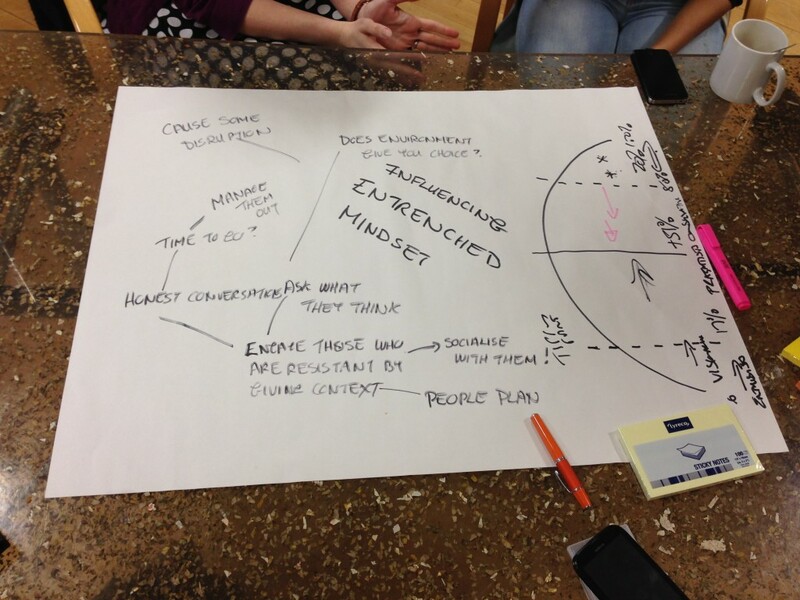 Twenty-five L&D professionals, one day, no structure – or maybe a little, and what do you get? The inaugural L&D Connect Scotland unconference, which took place in Edinburgh last week. From the opening discussions, a list of 23 discussion points were generated which were grouped into themes. 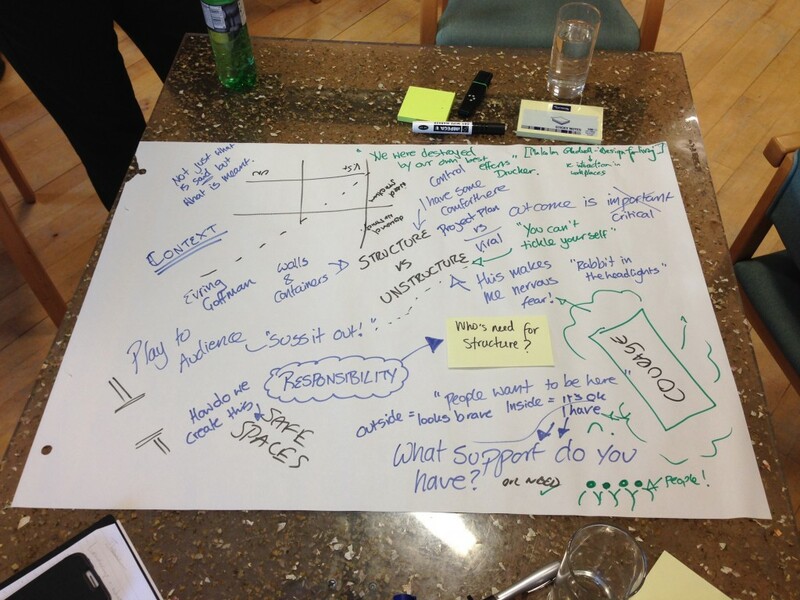 These themes were then discussed throughout the day in an open space discussion format. The discussions ranged from the how L&D can create more business impact to the role of social media in learning. Here we provide an overview of some of the discussions. This group discussed the 20% of people who dig their heels in and refuse to change. These people should be engaged to change. The ideal scenario is to influence those who are most resistant so that they can become our change agents. There were examples from around the table of people who had dug their heels in but then had got it, usually through personal connections or through a social connection. These people then had a really big influence on those who were against change. L&D and OD professionals also need to have honest conversations about where the organisation is going from a contextual point of view – explaining why colleagues were going there, getting their input and feedback and acting on their input. To ignore feedback is counterproductive and they won’t come with us. The discussions also looked at the impact of the environment in which people work and whether that creates the culture. The group also felt it was valid to throw in some disruption by imposing change. i.e. you may have been doing something a certain way for the last 20 years but from tomorrow you will be doing it this way. You may well have to decide if it is time for those who are resistant to change to go because we have all seen lost of organisations that have spent lots od time and effort trying to move people who have their heels in the ground, the hands in the air and who are saying, ‘We are not going there.’ We in L&D and organisations as a whole need to be more robust in having conversations with people to say this is not working. We need to have the skills and confidence to have these purposeful conversations. This group looked at what happens when you have structure – exploring the themes of control, comfort and the idea of project management/planning that can in itself serve a need and be useful. Unstructure sees people feeling a lot more nervous, there is less control in the system but with no control and no structure things can go more viral within an organisation. Overall, organisations tend to play to the project plan but how can they tap into the more viral elements? This led the group to talk about social media and what these tools can do. Personal qualities in these environments is also important. In unstructured workplaces, there is a need to demonstrate more personal responsibility and courage, stepping to the edge more. You also have to be brave but there also needs to be something around unstructured work environments that acts as a support. This might be people, experience or knowledge. L&D needs courage and the ability to take the initiative when it comes to less structured ways of working. This group looked at the four quadrants in this image which came out of 2012 research from the CIPD into business-savvy HR. L&D needs to understand the business in depth including the impact of the business on colleagues, customers and stakeholders and understanding the tension between the both. It also needs to understand the impact of data and ensure their is a high level of understanding at a high level within the organisation. Then there is the need to connect with curiosity, purpose and impact – understand what you do -and be the go to people, not the get to people. How can you influence what goes on the the org? A lot of people focus on the bottom two quadrants when they need to deliver on all four quadrants in equal measure. In particular, L&D needs to get better at data and insights from that data as well as having a deep understanding of the business. There was then a discussion around whether the current L&D curriculum is serving the profession? John McGurk, the CIPD’s head of Scotland, said that there was an emphasis on transactional L&D in the current curriculum but there was a need to get the balance right with these new business/data skills and that was something the CIPD was working on and why it is keen to hear from practitioners. The CIPD will be doing more research this year on the tpye of L&D skills required in the current business context. McGurk said that CIPD training centres should be using the CIPD research but the institute needs to be connecting more with the centres with curiosity, purpose and impact to ensure it is supporting them in the right ways. The context of this talk was the idea of challenging perceived ideas. Archie Cochrane, father of randomised controlled trials was one such person – read more here. He used data to challenge the perceived data around coronary care and the upshot was a change in the way doctors cared for patients who had heart problems. So what’s the relevance to L&D? In L&D we might do pilots but we won’t necessarily measure the results in six months’ time to see if it has a positive or negative impact. We tend to roll it out en masse to everybody. The risk is that if the programme has a detrimental impact on a small group then you will be spreading that across the entire organisation. The concept of prototyping is to start small, experiment, and measure the results of what you create so that you can act on the basis of evidence rather than on what you like or believe to be true. L&D could be taking this approach but isn’t because there is pressure from the business to deliver things wholesale. Indeed, L&D seems preoccupied with building products that have to be 99% ready to go. But we should have four or five micro versions of the product that we can experiment with so we can build a better product. The challenge with experiments is how to create them? Consider more agile ways to developing initiatives in the first place. L&D can raise the issues of experimentation and share success stories. And make sure you ask people outside of the business to see if what you are developing will really add value to the business. Adopt the right approach for the seriousness of the intervention. If it is important then the benchmark should be high. The role of social media was discussed in terms of its impact on how L&D delivers learning. It was also discussed in terms of how it was used within the unconference. There some mixed feelings about its use and a question was asked about how present you can be when you are tweeting. Interestingly, graphic artist Simon Heath, who was following the twitter stream for the event, produced an image to illustrate one of the topics of discussion, showing the power of sharing externally and then bringing that back into the room. 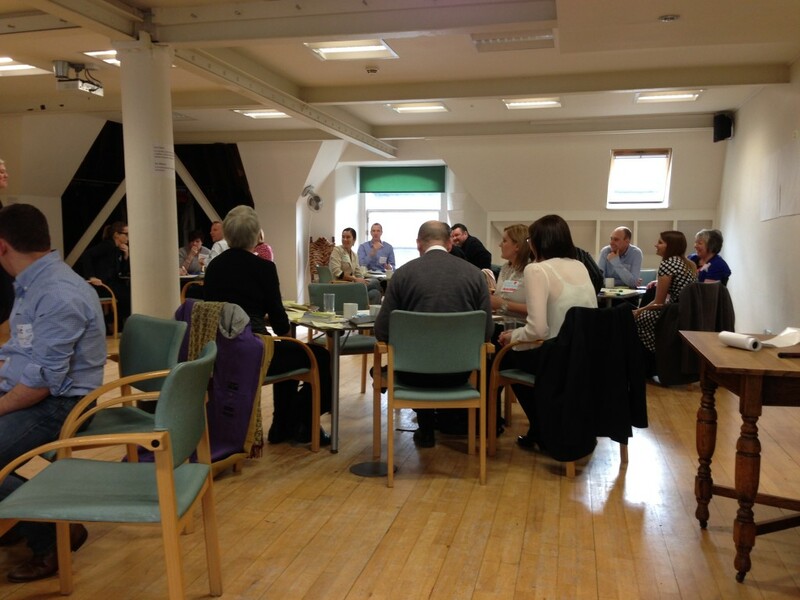 Other L&D professionals were also joining in the discussions via Twitter. What next for #ldcu Scotland? At the end of the day delegates discussed next steps. Participants were united in their desire to build on the day with many suggestions for what to do next and how to keep the conversations going. A venue was offered for the next unconference too. 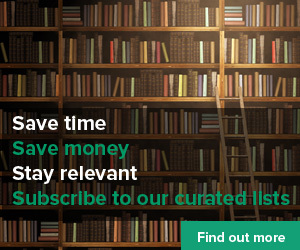 A Twitter list of participants was created, which you can see and subscribe to here, and there is an L&D Connect Linkedin Group which participants can also join. Before participants left, facilitator Jose Franca asked everyone to share an appreciative comment on the day. This is what was shared . 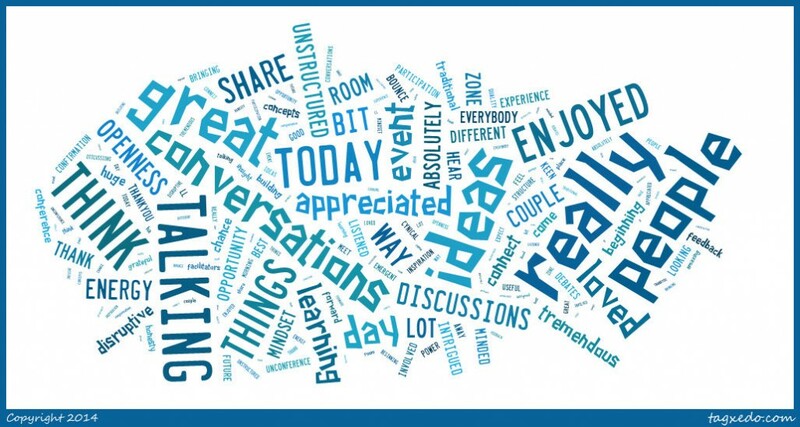 . . the word cloud is made up of all these comments. In a couple of conversations today, I was absolutely in the zone – really enjoying talking to the people I was talking with and they really got me thinking. That was tremendous, thank you. Great to connect with people with a disruptive learning mindset. I think this is the beginning of something. Grateful for the opportunity to be able to talk about things in a really different way and also to hear some of the things that have come out from everybody else. I learned a huge amount. I really enjoyed the day. I was intrigued and got so much out of it – the chance to talk to like minded people and be listened to has been great. Some one said before this is like the best bit of a traditional conference but for the whole day. I think it has been such a lovely experience to discuss ideas and concepts and bounce things off people and get feedback. Thankyou to everyone for being some open and am really looking forward to building on this event. I loved the energy today. Everyone was really involved in all the conversations and was keen to share ideas. There was a lot of openness. I’ll take a lot away from this event, which was my first unconference. I really appreciated everyone’s honesty and participation today. It was a confirmation of the power of bringing people together. Good to meet so many people and feel so much energy in the room. Ideas, insight, inspiration. I’m grateful to the facilitators because I am a bit cynical when someone says something is unstructured but I think it was unstructured in a useful way. It had an emergent structure. I had no idea what to expect this morning – I’m in a happy place just now. The quality of the ideas and conversations in the room has been amazing.